Cardiff Devils suffered their first defeat of the 2015-16 season with an 8-1 defeat at Sheffield Steelers on Sunday, just a day after beating Nottingham Panthers 2-1. Goals from Mathieu Roy, Jace Coyle, Jeff Legue and Levi Nelson gave the Steelers a 4-0 lead at the end of the first period. 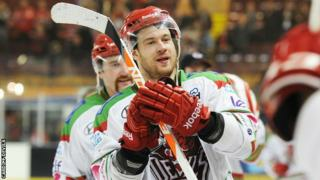 Devils player coach Andrew Lord pulled a goal back in the the second period, before Roy completed his hat-trick and Tyler Mosienko and Robert Dowd completed the rout.